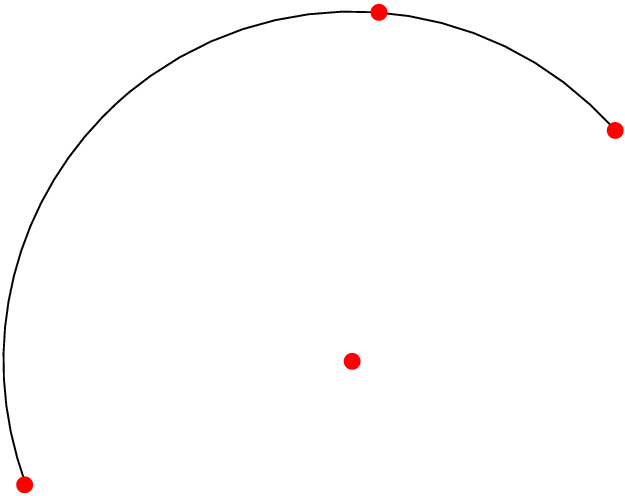 An ordered set of three points uniquely defines a circular arc, and I'd like to be able to draw that arc in TikZ. 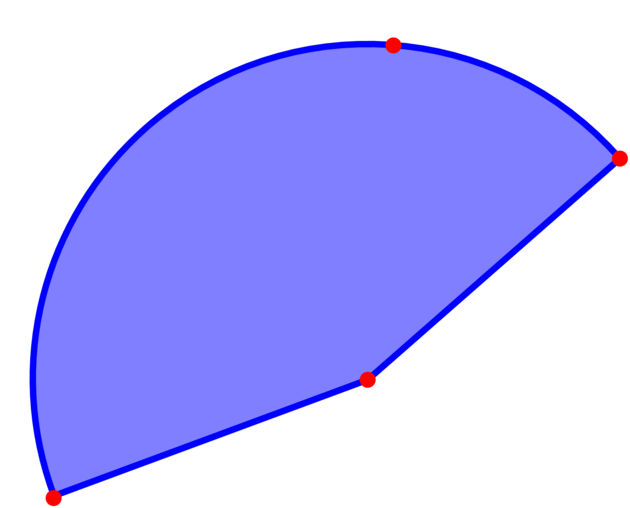 I know about the arc drawing command, which does the job given a radius, two angles, and one endpoint, but in order to do that I would have to calculate the radius and the angles from the other two points on the arc. I suppose I could whip up some code to do that automatically using the PGF math library, but is there a better way? Or has anyone else already made this into a package/library I could reuse? Use the following code to draw the arc corresponding to the circle through (1,2), (3,4) and (2,4) and going anticlockwise from (1,2) to (2,4). Keep in mind that I don't actually know TikZ. I did what you said: I used pgf math to work out the values for the angles and the radius and then packaged it up into a simple macro. 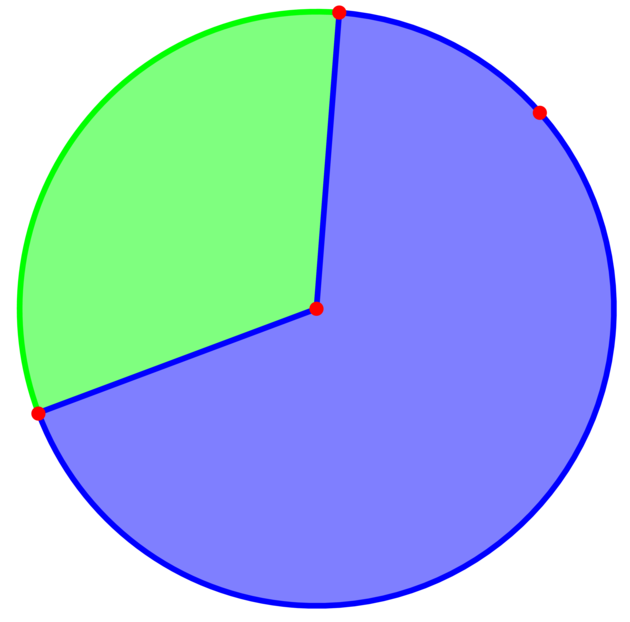 The macro assumes that the points are entered counterclockwise. It probably fails in some cases, since I didn't test it very extensively. I guess I should point out that that the computation of the center of the circle, (\cx,\cy) depends on some quantities not being zero. One can write down three linear equations relating \cx and \cy. Any two of them suffice for solving (of course) the system so there are three possible choices. I didn't check, but I believe it's impossible for the relevant quantities to all be zero (unless your points are colinear, but then you don't have a circle). If one were so inclined, one could generalize the computation of \cx and \cy depending on which two equations are used and then just pick one for which the denominators are not zero. Since there's a better solution, I didn't bother, but I guess I could if someone actually cares. Edit: The original code didn't work with TikZ 3.00 since atan2(x,y) has been redefined: its first and second arguments have to be switched. This edit fixes this. Just for completeness, a tikz solution which does not use tikz-euclide, but instead does all the calculations through calc library and let..in syntax. Macro \arcThroughThreePoints requires the three coordinates to be given in counter-clockwise order. I guess this answer does not qualifies as "the easiest way", as the title of the question requests, but it shows some nifty tricks. The following solution defines a to path arc through that expects one coordinate (including the () as it may preceeded with + or ++). the calc library and instead uses PGF’s already present macros \pgfpointlineattime and \pgfpointintersectionofline as well as \pgfmathrotatepointaround and \pgfmathanglebetweenpoints. arc through cw draws a clockwise arc. 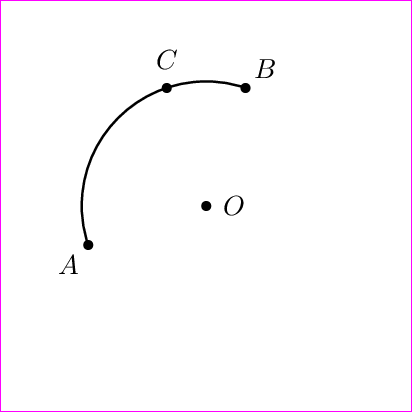 The coordinate arc through center is defined after the to path and can be used for later reference (as long as no other arc through is drawn). This solution uses the same calculation algorithm as the one in JLDiaz’ answer. I was browsing in the TikZ/PGF manual when I came across the \pgfpatharcto command. This draws an arc from a point to a specific point, with a given radius (actually, elliptical radii). So once the radius has been figured out then this command can be used to draw the arc. Of course, once one has computed the radius then the angles aren't all that difficult to compute either so this isn't a great solution. Moreover, the manual specifically warns that the computations involved in \pgfpatharcto are unreliable. So I'm posting this partly to highlight the \pgfpatharcto command but mostly to recast the solution as a to path. There are a couple of comments on this code. The key for specifying the mid point is actually /tikz/arc between/mid point. The key /tikz/arc between switches to the subtree /tikz/arc between. This means that any subsequent keys are taken relative to this subtree. In Proper Code, there ought to be a fall-through so that any TikZ keys are passed back to the /tikz tree. Secondly, this doesn't update the last position properly, so using relative coordinates after this command will be relative to the starting position. I'm not sure of the best solution to that. Actually, back on that first point. A better method would be to specify the mid point as an argument to the /tikz/arc between key. Using TikZ, how to draw an elliptical arc starting from point A to point B with the origin as its center where both radii are given? How to add decorations to tikz-qtree branches (for example, create AND-branches and OR-branches)? How can I draw an arc between two Cartesian coordinates and fit nodes into a big one? Save TikZ plot points calculated with PGF math library to .table file? How to automatically obtain the center of the circle used to draw the arc in TikZ?